Rockstar: Multiple Characters in Grand Theft Auto V a "Leap of Faith"
Rockstar art director Aaron Garbut admits that having multiple main characters in GTAV was an interesting idea that could "backfire." Speaking to EDGE, Rockstar art director Aaron Garbut revealed that right from the start of development of Grand Theft Auto V, the studio decided it wanted three "switchable" characters to be the protagonists; but also admitted that it was a "leap of faith," and how it could have backfired. We decided right at the start we wanted to do three switchable characters, we decided who the main characters were and we decided the general tone for the game. Then we just built and evolved and let the game dictate itself...[Having] multiple characters was a leap of faith. It was an interesting idea, and it felt like we could do interesting things with it, but it also felt like a change to the core of the game that might backfire. I think it really worked out. It's so hard during development to get perspective - you get so used to looking for the problems that it becomes almost impossible to step back and see the positives. 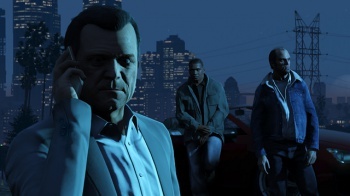 For those who've yet to play GTAV, the series' fifth main entry had three controllable protagonists in Michael, Trevor and Franklin, whose stories interconnected as the player completed missions. Released last year for the PlayStation 3 and Xbox 360, GTAV was not only a commercial hit, but even snagged the VGX's Game of the Year award beating out the likes of The Last of Us and BioShock Infinite. You can read our review where we recommend buying it "only if you're prepared to play as characters with no justifiable motivation for doing awful things to people."